Extraordinary stoneware bowl of the famous ceramic artist Lucie Rie. Slightly beige-pink matte glaze with stronger pink spots, brown, partially bluish edge. Interior and exterior wall with sgraffito decor. Partially brown speckles. Measures: H 9.3 cm, D 16.3 cm. Marked on the bottom: workshop mark (stamp). Provenance: Acquired in 1980 in the Kunstkammer Germany. Documented on an archive sheet of the Kunstkammer, 1980. 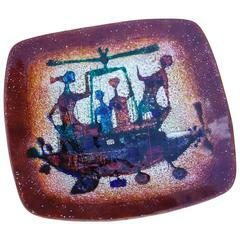 A rare 1950s Italian enamel low bowl handcrafted by Studio Del Campo, with a fantastic airplane figures. Elegant Gucci bowl in ebony and golden Gucci sign. Beautifully shaped, these matte white ceramic was designed by Tom Ford for the Gucci store in Florence 1994. Signed Gucci and Made in Italy. A must have for every fashionista. Lucie Rie; Elegant handled shallow stoneware dish in cream with manganese oxide lip, late 1950s. Underside signed with impressed artists seal.